Designed by RSP Architects Planners & Engineers’, the new Design School at Singapore Polytechnic (SP) is set to officially open in mid-September. Entering by the T2 block, one would be led in by a long pathway with the new food court, foodnode, on the left and a generous gallery space to the right that stretches throughout the whole corridor. Walking through, there would be series of openings that connects to the very large Common Foundation (CF) studios on one side of the corridor, which is actually located a level lower than the corridor. It is quite a beautiful play of the volume of spaces, by the architect, to create a more interacted corridor space, instead of just making a boring long corridor. On the other side of the corridor is foodnode, the food court that also has an outdoor seating area that extends to the entrance plaza. It has a warm interior with material finishes of wood and concrete with a series of feature pendant lights to break away from the strict regular grid ceiling lights. Connected to the plaza is the core circulation route, with a triple-volume space that visually connects to all the levels. This transition space is sheltered but seems very transparent and open with the well-planned openings. 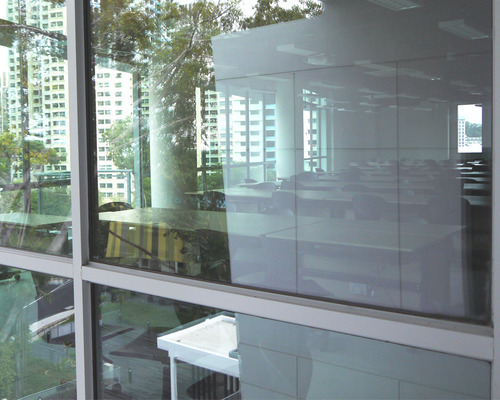 Pockets of meeting spaces can be seen at the core circulation route, through the slightly tinted full-height windows. 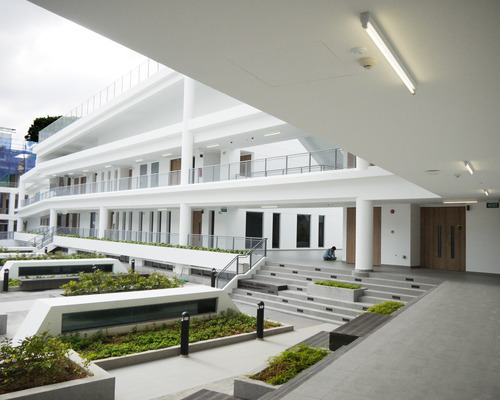 ­While the pristine white walls may be a bit jarring for some, being most of the architecture in Singapore being intensively cladded with aluminium or glass, it is refreshing to see the smooth white walls be brought throughout the entire building. At some time in the day, with good weather, the walls seem to disappear into the sky. The orientation of the windows is also an improvement from the previous studios, which was receiving most of the evening sunlight. Many of the openings and orientation of rooms react well to the Sun’s path, offering well-lit, healthy spaces. It is also good to see that the architect had kept the majestic trees surrounding the site, creating amazing learning environments in the studios. There are enough public space for the students to put down their cutting mats and finish those last minute touch-ups before submission. Overall, it is a very interesting and engaging space, kudos to the architect and design team, for designing a well-balanced architecture of nature and the built for a design school. From the CF studios being at the ‘root’ of the building, to the staff spaces located at the core circulation space, one can definitely sense the amount of sensitivity and thought the architect had for the new Design School building. Being a design school alumnus, I can safely say that this new space definitely evokes the atmosphere of the learning in a refreshing manner, and that is what matters!